I think it’s safe to say that every Jewish grandmother who has proclaimed, “You should eat more!” has a mean recipe for chicken soup in her arsenal. 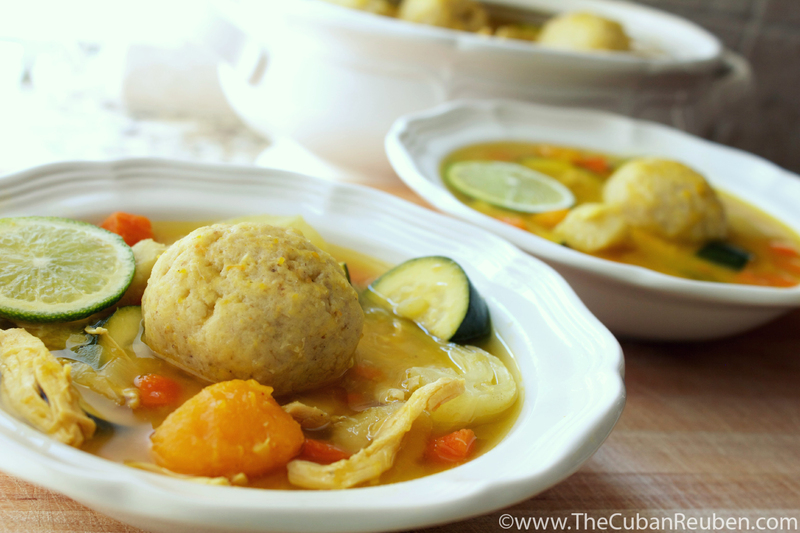 For generations, colds and flus have gone to battle with bowls and bowls of Jewish penicillin made by these Bubbes, and my Abuela was no exception. My produce pile. Malanga looks a lot like a small woodland creature, before it is peeled. I come from a family of strong women, so it is fitting that our recipe for chicken soup isn’t the clear-broth version with a lonely floating carrot slice. Ours is a stick-to-your-bones and prepare-for-war kind of soup, chalk full of nutrient-rich vegetables and flavors that awaken the senses. My favorite part of this soup is how the kabocha squash disintegrates into the broth, giving it a wholesome creamy texture without the heaviness of added butter or milk. Plus, the crunch of the bok choy and zucchini packs a solid punch of vitamin c, and makes it easy for me to eat my greens. Couple all of this with my mother-in-law’s recipe for the fluffiest, most light-as-air matzoh balls, and you’ve got yourself the better part of a Seder. As featured on The Nosher, at MyJewishLearning.com. My allspice and bay leaves pouch. 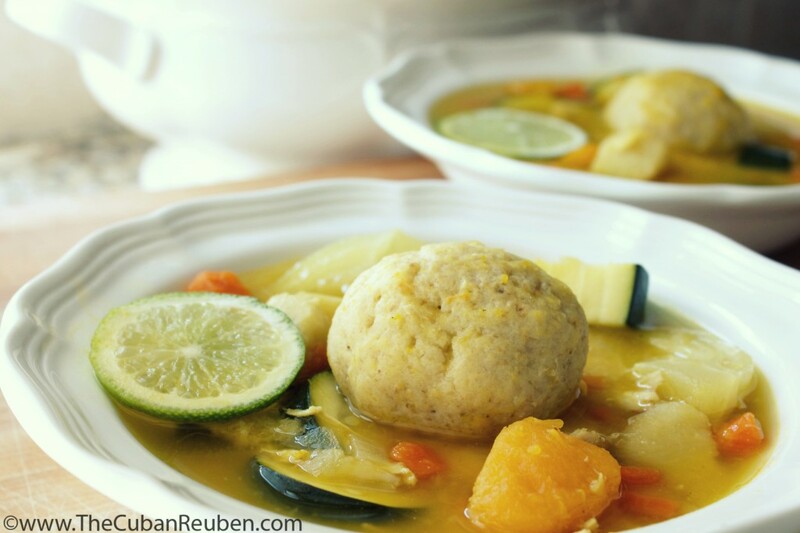 This recipe may be a mish mosh of the traditions of my husband’s family and mine, but it is certainly one I would be proud to share at any Passover table or year-round. 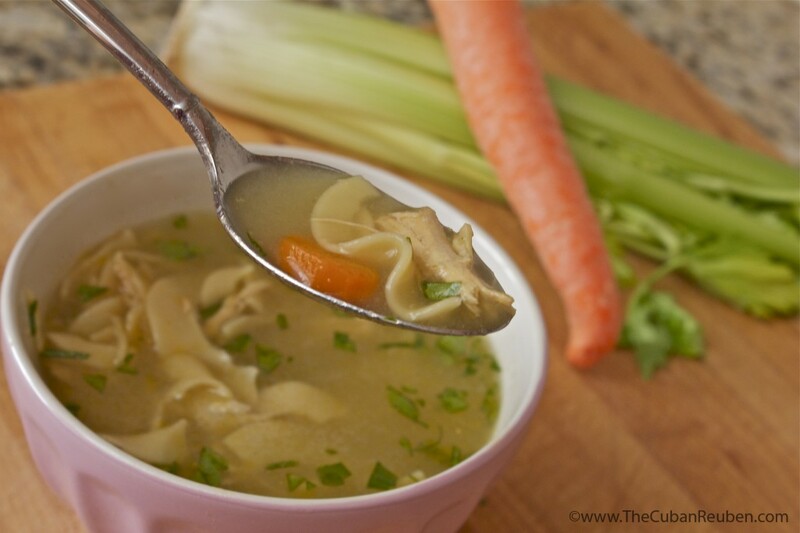 The thick broth is the best part of this hearty soup! Serve this hearty, stick-to-your-ribs soup during Passover or year-round. Combine all ingredients until just mixed, careful not to over mix. Cover the mixture, and refrigerate for at least an hour. Boil water with salt (or chicken broth). Oil hands, then make small balls (1 inch in diameter), and add them to boiling water. Cover, lower the heat to medium low and simmer for about 25 minutes. Transfer the matzoh balls to the soup. In a large stock pot, heat olive oil over medium/high heat. 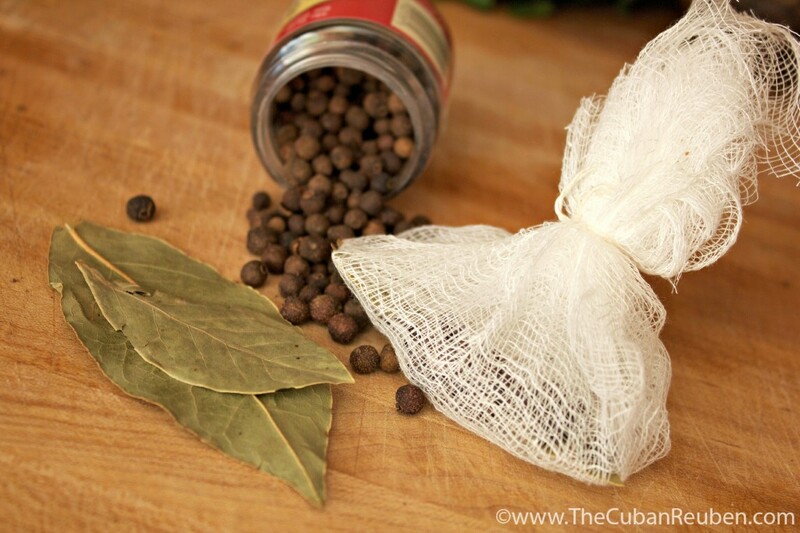 Using a piece of cheesecloth and kitchen twine, tightly secure the 15 allspice berries and the bay leaves together in a small pouch. Place onions, carrots, chicken pieces and the spice pouch in the stock pot, and sauté for about 8 minutes, or until onions are translucent and chicken has slightly browned, mixing frequently. Add the garlic, the malangas, and broth. Bring to a boil, cover and cook for 15 minutes. Add the bijol powder, the culantro, kabocha squash, salt and pepper, and cook for another 15 minutes. Remove the chicken pieces, set aside until cool to the touch, shred them, and then return to the soup. Add the bok choy and zucchini, and cook 10 more minutes, or until bok choy softens, and zucchini are cooked through. 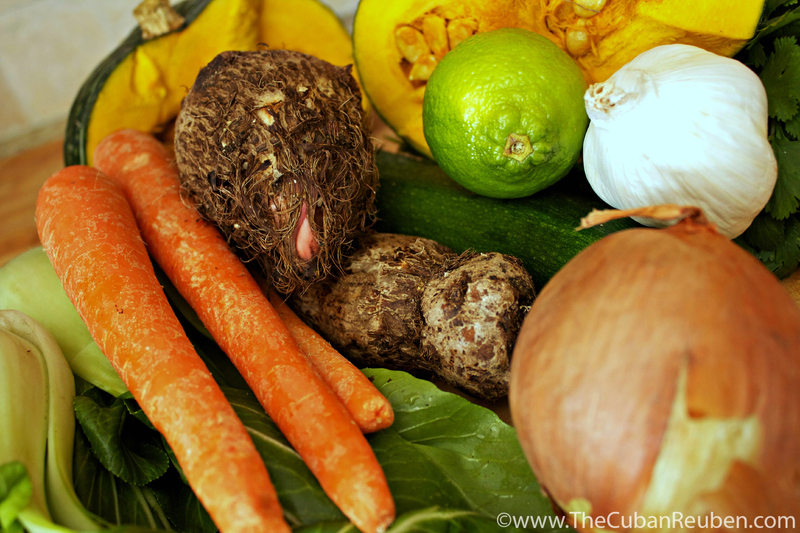 Remove the culantro leaves and the spice pouch. 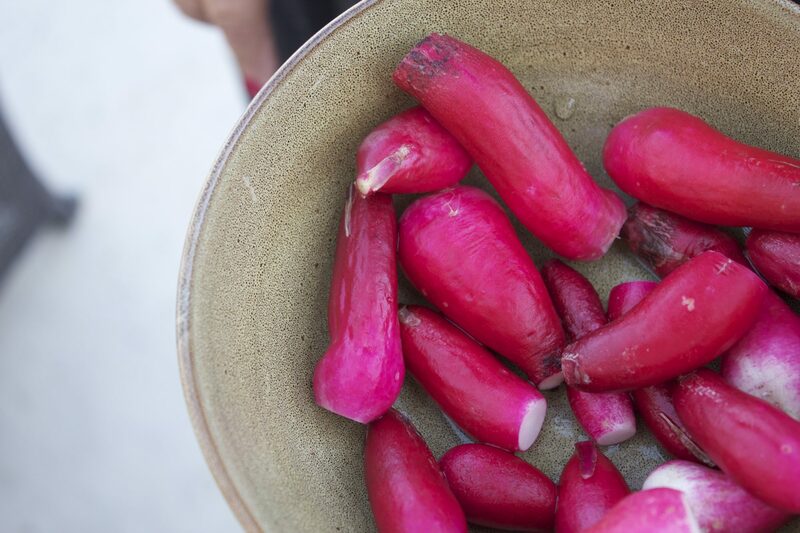 Serve immediately, or cool and refrigerate or freeze for later use. Garnish with slices of lime. Bijol powder - saffron powder, achiote powder, or omit from recipe, as it is optional. Culantro leaves - 1 bundle of cilantro, secured in cheesecloth, so that it won't dissolve into the soup and can easily be removed. It’s no secret that I’ve been sixty-five since I was twelve. My friends all jokingly call me mom (and some even call me grandma), as I not only enjoy the senior citizen-friendly past-time of watching 20/20 on a Friday night, but I’m pretty sure I skipped the whole “clubbing” phase of my early adulthood in favor of cozying up in my living room for a more intimate affair with a few friends, a bottle of wine, and smarty pants board game. I’m also the one they turn to when they want a bit of nurturing and comfort, which is how my chicken soup tradition started. During my senior year at college, on a frigid Chicago winter day, I found myself surrounded by puffy-eyed, crimson nosed, cold and flu-infested friends, whose mothers were all at least 1000 miles away. Somehow, I managed to avoid the plague, and was the only healthy one of the bunch. I remember thinking that if I were sick, and my mom was nearby, she’d rush over with a warm pot of soothing chicken soup, but since our mothers were all in other states, the onus was on me. I called my mom and all of my extended “moms,” in an effort to make the best pot of soup, combining elements from all of their recipes. My goal was to make a huge batch, in order to freeze individual portions, and deliver them to my mom-less friends as needed. As I finished my first round of deliveries, word got out that I may have found the cure for the common cold, and I started receiving requests. I’m pretty sure a couple of those deliveries went to people with fake coughs, but it warmed my heart nonetheless that I was able to provide a little bit of comfort to my fellow students who were far from home. To this day, I still keep individual portions of soup in my freezer, because you never know when a friend might need a little Jewish penicillin to kick that cold to the curb…Or maybe they’re just looking for a little bit of home-cooked comfort in a bowl. My fool-proof, cold-busting Jewish Penicillin, that is sure to warm your belly and comfort your soul. In a large stockpot, saute the onions, carrots, celery, and garlic in the olive oil over medium to high heat, until the onions are translucent. Add the chicken breasts, and stir in the seasoning blend, salt and pepper. Cook the chicken until both sides brown, then add the chicken broth, water, parsnips and bay leaves. Cover the pot, and let cook. After 30 minutes, remove the chicken breasts and set aside to cool. Lower the heat on the pot to low. Once the chicken is cool enough to handle, use two forks to shred the meat, and return it to the pot. Return the soup to a bowl, remove the parsnips and bay leaves, and add the noodles. Cook the noodles according to their package instructions. Add more salt and pepper to taste, as well as the chopped parsley and the optional pinch of bijol seasoning. Either serve immediately, or let cool and freeze individual portions for future use.